A super-stylish, premium quality Christmas Tree bandana in lovely festive shades of green. 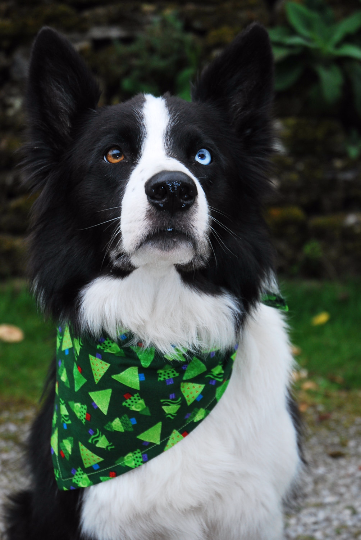 A striking green luxury Christmas Tree dog bandana, handmade in the Yorkshire Dales by Dudiedog Bandanas. The trees are in shades of bright green, with brightly coloured pots. "Bought this for my white Jack Russell called Willow. Came really well wrapped and very quickly with a hand written note and washing instructions. It's a heavier cotton and washes really well and looks great for the festive season. Highly recommend this product."